Replacing a whole trampoline can be expensive. Only replace the parts you need by purchasing authentic Skywalker Trampoline parts. These parts work with the original manufacture parts. The Skywalker Trampoline 14' Round Replacement Enclosure Part, Straight Tube, measures 40.5" Length x 1" square Width. Product Details: Skywalker Trampoline. 15' Round. 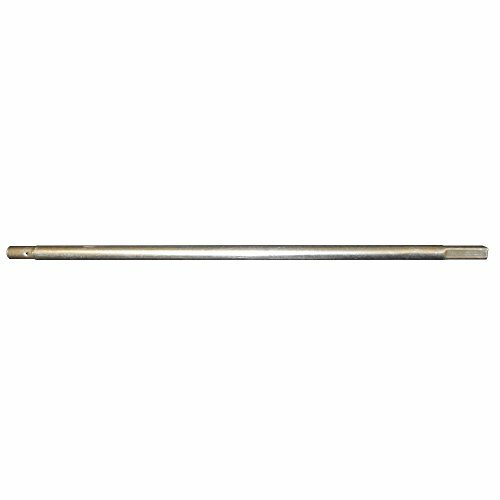 Part List Description: Straight Tube. Key # 9. One End is Square, the other end is Round with one hole. Sold in quantities of ONE. (Six pieces are needed to complete the trampoline.). Fits 10ft models: ATC10B SWTC1000 SWTC100G. Fits 12ft models: JTEC12B JTEC12R OWTC12 STEC12B STEC12G STEC12P STEC12R SWJD12 SWJD12B. Fits 14ft models: SWTC1400 SWTC1400WS. Fits 15ft models: STEC15 STEC155. Fits 13x13 Square trampoline model: SWTCS1300. Do not order if your trampoline does not say Skywalker Trampolines. Product Details: Fits a Skywalker Trampoline, fits only certain models! Check your model number. Original Replacement, you can reuse the top curve pole. Lower straight enclosure pole with square end, does not fit all brands. Upper curve pole sold separately, the lower pole is usually the pole that breaks. There is a bigger size, Do not order if your trampoline doesn't say Skywalker Trampolines, Not for all 15ft models. Mostly for smaller trampolines, 10ft, 12ft. Email us your model number if you have questions. 15' NEW DELUXE BLUE VINYL TRAMPOLINE PAD - $99 VALUE!! !